This entry was posted on Sunday, February 2nd, 2014 by Frances Ryan. Sock monkeys, sock monkeys, and more sock monkeys! When I made my first sock monkey last year, I didn’t really envision myself making another. But last summer I broke out the needle and thread when I was sick and created a second monkey. Then a couple of weeks ago, I found myself creating a third. Half-way through that third monkey, I lucked into a free sewing machine so I finished off the monkey’s arms and tails with a machine in minutes! 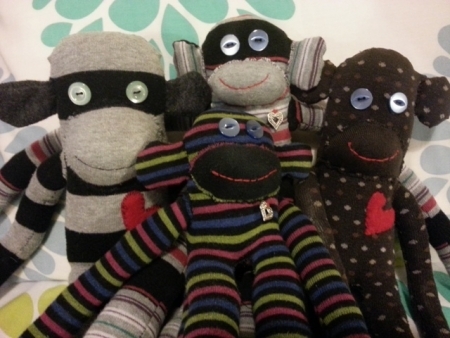 And that made me realise that I can actually go into a bit of sock monkey production. So I broke out the sewing machine yesterday afternoon and by this morning I had another two monkeys to add to my troop! But before you start worrying that I will soon be lost in a sea of monkeys—these guys are all spoken for! The black and grey guy on the left (Red 42) will go to my eldest niece, Virginia. The next one over (Pinky Toes) is for my dear friend, Bea. The spotty one on the right (Dotty) will go to my niece, Krystyne. And the little guy in front (who has yet to be named) will find his way to my cousin, Genie. My goal is to make a sock monkey for all of my nieces and nephews who want one. Though I have to stop production for a while so that I can finish a swirl I started when I was on my American holidays—and then I need to finally start working on a special swirl for my friend, Sharon. OMG! I love those sock puppets! They are so cute! Yes I am overusing the !!!! I wish I had some cool sox to send you to make some more. You are getting so crafty. Maybe these could go on Etsy as well. They are fun to make, but I don’t think I’m good enough to put them up on Etsy - yet! Maybe by the time I’m done making monkeys for all of my nieces and nephews, my skills will be good enough to try to sell them. I am going to try a couple different ways to attach the arms for the next couple of monkeys which might make them nicer. Or not. We’ll see! !